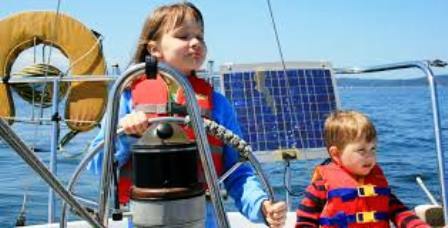 Teach children sailing and the basics of learning how to sail a boat and it can also teach your children many of the skills they will need to live a better more mature life for the rest of their lives. 3. 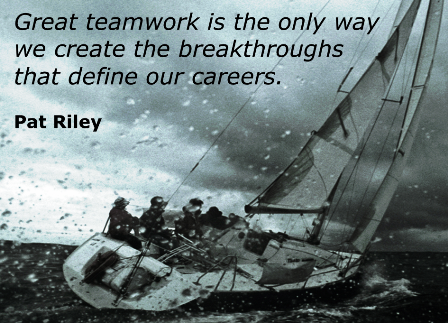 How to establish and reach goals. 5. How to handle emergencies. 6. How to plan ahead. 7. How to be observant. 8. How to be independent. 9. Which way is the wind blowing? 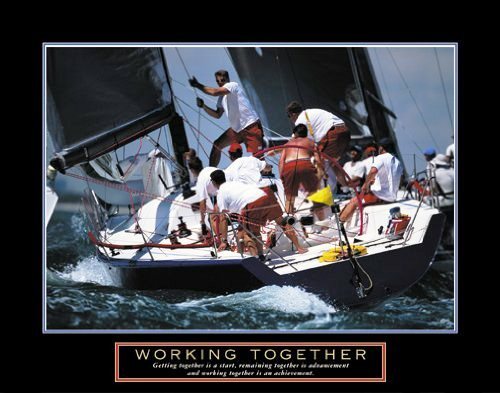 Can you teach children sailing and how to really learn all of these lessons simply by teaching them how to sail a boat? The answer is an emphatic: YES! 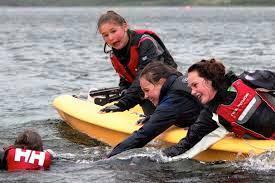 Teach Children Sailing the Benefits! My wife and I taught all eleven of our children how to sail. Why? First of all it is fun, entertaining, and a great way of "bonding together" for all and it is a skill that can enrich their lives in many, many ways. Second, we did it to prepare them for a lifetime of responsible, happy, safe and independent living when they get "out there" all by themselves and on their own. The way we started to teach children sailing them was to sit them, one at a time in the cockpit of a small sailboat, near the stern (back end) of the boat and get them to hold the tiller with one hand. "Hold what?" the student would ask. "We would reply: "The tiller is the long straight handle that moves the rudder, the "rudder "is used to steer, or direct the boat through the water in the direction you tell it to go by moving the tiller, it is almost like a steering wheel in a car. 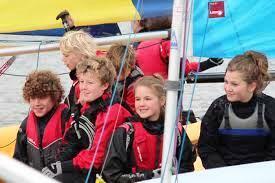 Next we told the student about the mainsail, the boom and the head sail (the jib). Then we pointed to the control ropes (lines) such as: main halyard,(to control the hoisting of the main sail), jib halyard, jib sheet, center-board and mooring lines. Next, we asked the student to point in the direction the wind was coming from. Many times we were asked: "Why do I have to know that?" Then we would tell them:" This is a "sailboat" that uses the wind to move it through the water, it has no motor or engine, instead, it uses "wind-power" to go from point A to point B. Then, after a few more instructions - all designed to put their minds at ease and to teach children sailing, we got out of the boat and told them we wanted them to take control of the sails, the rudder and the tiller and steer the boat away from the dock and move out into the nearby lagoon all by themselves while we stood on the dock and told them what to do with the sails and the tiller. Of course, the student made many mistakes and at times had no idea what to do to correct what they did, but - after much patient instruction from us, back on the dock, they began to understand what the boat did every time they moved the tiller or changed the trim of the sails. The hardest part always seemed to be to get them to understand where the wind was coming from and how to use the tiller so they could steer properly. Well, I won't go into all the details of teaching the kids how to sail, but the fact is we all had a good time and lots of laughs later around the dinner table, about the mistakes and silly things they did while learning the basics of how to sail a boat. There always came a day, for each of the kids, when he or she could board the boat, cast off and sail effortlessly out into the lagoon and bay without the need for me, as I stood on the dock, to give any instruction at all. 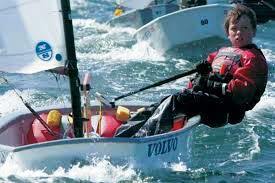 Proud that I have been able to teach children sailing. 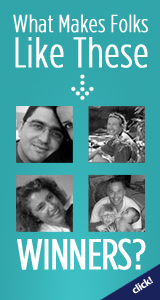 They were on their own, and doing very well, and we all had a feeling of wonderful satisfaction and accomplishment. Later, we could all go aboard our much larger 23', sloop rigged sailboat and go out in Barnegat Bay for a day of sailing, swimming and fun as a family. In the beginning, I would always take the helm; (the tiller) and I would be the captain who gave orders to my crew of sailors. By this time they all knew the various parts of the boat and it was easy to give a command, something like: "Ben, haul in mainsail." Ben would reply: "Yes Sir!" Or: "Scott, the jib needs to be eased (let out)," He would answer with: "Yes Sir!" Or,"Doug, stand by to come about!" Doug would shout back at me: "Aye, aye, Sir!" My next teaching job was to rotate the crew and let each one take his or her turn as the captain, where they quickly learned how to give orders properly to their brothers and sisters who were their crew. 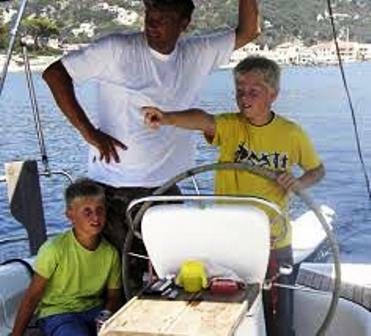 Orders always had to be obeyed and answered immediately and even that was a learning process for the whole family, when it came to teach children sailing. The captain has to know what to do to: stay in deep water, keep an eye on the changes in the weather, know what to do to keep the boat from healing (leaning) too much, watch out for other boats, figure out which way to turn to get back to the dock at home, learn to sing sea chanteys and much more. How did it Benefit them as Adults! 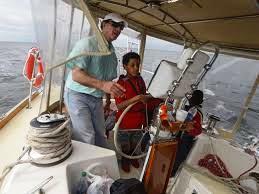 When you volunteer to take on the fun-filled task of teaching your children how to sail a boat, you can expect to have the privilege of (later) seeing the far-reaching and beneficial results of what you did to teach them the basics of how to improve their lives. 1-University Professor, 1-Lockheed Corp. Leader/Advisor of Ship Designing Engineers, 1-High School Teacher, 1-College Computer Advisor for College Teachers, 2-Elementary School Teachers, 1- Graphic Arts Designer, 4-All - Good Paying Jobs.